I'm a bit late in compiling this annual list (its two years old now, so its annual), but here it is, my Top 10 Science Stories of 2007. They are not necessarily the most important science stories from the previous year, more the stories that moved me. Follow the links within the stories for more information. Listen to the show on the podcast here (including some snippets from my favourite songs of 2007). James Watson (pictured) was awarded the 1962 Nobel Prize in Physiology or Medicine for being part of the team that discovered the structure of DNA. However, on October 14, 2007, Watson was quoted as saying he was "inherently gloomy about the prospect of Africa" as "all our social policies are based on the fact that their intelligence is the same as ours — whereas all the testing says not really." This is obviously not the type of rhetoric one expects from a Nobel laureate. He went on to say that whilst he hoped everyone was equal, "people who have to deal with black employees find this not true." He also said that "there is no firm reason to anticipate that the intellectual capacities of peoples geographically separated in their evolution should prove to have evolved identically. Our wanting to reserve equal powers of reason as some universal heritage of humanity will not be enough to make it so." Watson issued an apology a few days later saying that he was "mortified" and "cannot understand how I could have said what I am quoted as having said ... To all those who have drawn the inference from my words that Africa, as a continent, is somehow genetically inferior, I can only apologize unreservedly. That is not what I meant. More importantly from my point of view, there is no scientific basis for such a belief." Whilst one Nobel Laureate was saying unscientific things, a scientific body - the Intergovernmental Panel on Climate Change (IPCC) - and a complete non-scientist in Al Gore won the Nobel peace prize for their "efforts to build up and disseminate greater knowledge about man-made climate change, and to lay the foundations for the measures that are needed to counteract such change". This is just another sign that Climate Change is gradually becoming a very important issue in the eyes of the world, even if the awarding of a peace prize to me seems a little strange. And whilst global warming really is the number one story of the year, I'm putting it here at number nine, just to be different to every other list that's out there - including last year's top 10 on Mr Science. The IPCC, made up of 3,000 delegates from 113 countries, released its final report in Febuary 2007 and stated, rather definitively, that climate change was man made and here to stay. The report, the first since 2001, was based on much improved data which has led the IPCC to predict that if carbon dioxide levels in the atmosphere rise to double what they were in the pre-industrial world (280 parts per million), temperatures will rise by 3 degrees. In 2005 we had 379 ppm carbon dioxide. "There can be no question that the increases in these greenhouse gases are dominated by human activity," says Susan Solomon, co-chair of the working group. "Warming of the climate system is now unequivocal. That is evident in observations of air and ocean temperature as well as rising global mean sea level." "The 2nd of February in Paris will be remembered as the day that the question mark was removed from the idea that humans had anything to do with climate change," said Achim Steiner, executive director of the United Nations Environmental Programme. "The focus of attention will now shift from whether climate change is linked to human activity and whether the science is sufficient to what on earth are we going to do about it." One of the great tragedies in modern memory is the extinction of the Yangtze Dolphin. The Yangtze Dolphin is the first large animal in 50 years to be driven from the planet, and only the fourth entire mammal family in 500 years to be destroyed. Having lived on the planet for 20 million years, time of death was called on Wednesday 8th August with the dolphin officially declared extinct by a report in the journal of the Royal Society, Biology Letters. It is the first species of cetacean (whale, dolphin or porpoise) to be killed off by human activity. This is almost my ultimate fear, to be trapped inside in my body without any means of communication. In 2007, a woman was found to have near-normal brain activity, even though she had been diagnosed as vegetative for five months because she didn't respond to stimuli. Whilst the active core of her brain had lost its connections to her body, she was still very much alive inside her own head. The technique used to uncover this is called Functional Magnetic Resonance Imaging, which tracks blood flow to different parts of the brain. When the doctors asked her to imagine playing tennis and walking through her home, the scan showed blood flow in the brain, which in healthy people, is associated with language, movement and navigation. Indeed, her patterns were exactly the same as the those from healthy people. Using this technique, electrode stimulation was able to restore consciousness to another man who had been diagnosed as in a vegetative state. Another regained consciousness after 19 years in a coma, and says that he was conscious the whole time. Talk about a nightmare. Two minisubmarines planted a titanium alloy Russian flag on the ocean floor, 4261 m under the Arctic Ocean surface at the North Pole. It is the first time the technical feat of reaching the North Pole sea floor in a manned craft has been achieved and is not only a sign of Russian strength, but a clear indication of the fact that Russia wants to claim the possibly resource rich area. The submersibles were named Mir-1 and Mir-2 – clearly Russia has a penchant for calling their scientific explorer craft Mir. 2007 saw the discovery of a spate of new extrasolar planets - planets orbiting other stars. Astronomers identified a small rocky world called "Gliese 581c" which had initially held hopes that it might be like the Earth - astronomers now believe it is more like Venus and has a run-away greenhouse effect. Astronomers also generated the first weather map of an extrasolar planet - HD 189733b - and also found evidence for the presence of water on the planet. Hollywood has long been comfortable with the idea of being able to erase a single memory in your head. It seems now that science may have caught up. Neuroscientist Joseph LeDoux from New York University has erased specific memories from the brains of rats. To conduct this experiement, LeDoux traumatised rats by playing a siren and a beep in association with an electric shock. In this way, they associated the sounds with the shock and "planted" this memory in their brains. When the team administered the enzyme inhibitor U0126 directly into the rats’ amygdala, a section of the brain associated with emotion, rats not given the drug were scared of the sounds, but those who were were no longer fearful of the beep. This suggests that the beep/shock memory had been erased - or perhaps blocked. It is difficult to find conclusive proof here, as well, rats can't talk. 2007 was a big year for robots. The First Robot That Walks Like a Human was developed, the first robotic ankle was made, and robots learnt to help and deceive each other. Until 2007, walking robots relied on heavy-duty computational power, calculating the angle of the knees and ankles every moment for each step. RunBot, developed by Florentin Wörgötter of the University of Göttingen, takes a simpler, more human approach by, rather than exerting continuous control over each step, it just falls forward and then reacts - like a human. Conventional prosthetic ankle-foot combinations are just not as good as a natural step - until now. Researchers reported the first robotic ankle that adjusts to the user to the terrain. Dario Floreano of the Laboratory of Intelligent Systems at the Swiss Federal Institute of Technology has found that robots can evolve to communicate - both truthfully and with deception. Floreano designed robots with light sensors, rings of blue light, and wheels. He then put them in ecosystems with “food sources” and “poison” that recharged or drained their batteries. Each of their "brains" had 30 software elements (genes) that determined how much they sensed light and what they did when they did. Initially, the robots just moved randomly when they sensed light, but in the next generation, Floreano recombined the genes of those that proved fittest (those that found the most food), and added some random changes - mutations. This was robot reproduction. Four different families ate, reproduced, and died, and by the 50th generation, the robots had learned to communicate. In 3 families, they lit up to alert the others when they’d found food or poison. In the 4th family, some robots however had evolved to light up to tell others that poison was food, while they took all the actual food for themselves. Other robots were heroes - signalling danger and sometimes dying to save others. 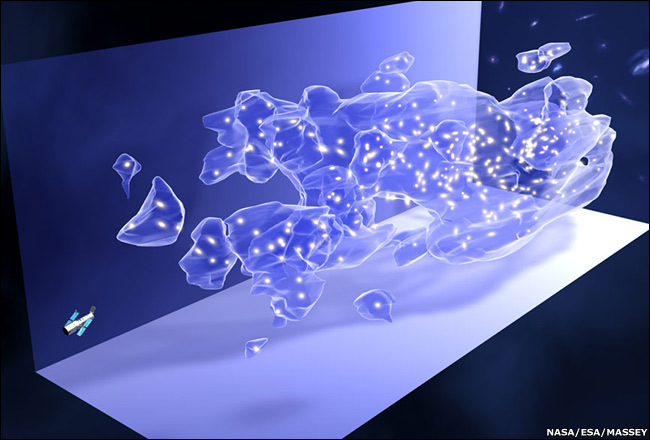 Early 2007 saw the first map of the Dark Matter in the Universe produced. Dark Matter is a theoretical form of matter that can not be observed directly, but whose presence can be inferred from its gravitational effects on visible matter. Using the Hubble Space Telescope, scientists compiled a dark matter map of a tiny part of the sky - about two square degrees. The map was published in the journal Nature and confirmed that galaxies form within enormous clouds of dark matter. In the early universe, it is thought that dark matter provided the gravitational scaffolding on which ordinary matter coalesced and grew into galaxies. Mapping it through its gravitation effects - as it does not emit or reflect electromagnetic waves you can't actually see it - is an enormous achievement. And the top story.... 2007 saw two teams of scientists independently discover a method to turn ordinary human skin cells into stem cells with the same characteristics as those derived from human embryos. This could have truly revolutionary implications as it bi-passes nearly all the ethical issues that have prevented research on human embryonic stem cells. It may also allow scientists to make stem cells from someone's personal genetic make-up - in this way, they will not be rejected by their body if implanted or used to grow new organs. Shinya Yamanaka of Kyoto University and James Thomson from the University of Wisconsin have taken out this year's number one spot due to this marvellous discovery. "Embryonic stem cells can divide forever, and there has never been good evidence for such cells in adults, but this new paper shows a method to make cells essentially identical to embryonic stem cells," said James Thomson. "This will change the ethical debate." "We are now in a position to be able to generate patient- and disease-specific stem cells, without using human eggs or embryos," added Dr Yamanaka. "These cells should be useful in understanding disease mechanisms, searching for effective and safe drugs, and treating patients with cell therapy." Research in this area opens up the possibility of curing degenerative and genetic disorders and such discoveries can not be understated. Well, that's it for another year. Let me know if you agree or disagree. You can listen to this show on the podcast here.